A Persian cat with sino-orbital aspergillosis affecting the right nasal cavity and orbit, due to Aspergillus felis infection. The fungus has invaded from the nasal cavity into the orbit and grown behind the eye, pushing it forward. This has resulted in swelling (white arrows). SAT has recently featured a number of blogs on fungal disease (mycoses) and those who study fungi (mycologists). One of the reasons is that fungal diseases are so neglected when it comes to research funding. But they’re a real issue and the incidence appears to be increasing, in both humans and animals. Unfortunately I recently lost a non-human companion due to a fungal disease resulting in acute fungal hepatitis. Investigations are continuing. 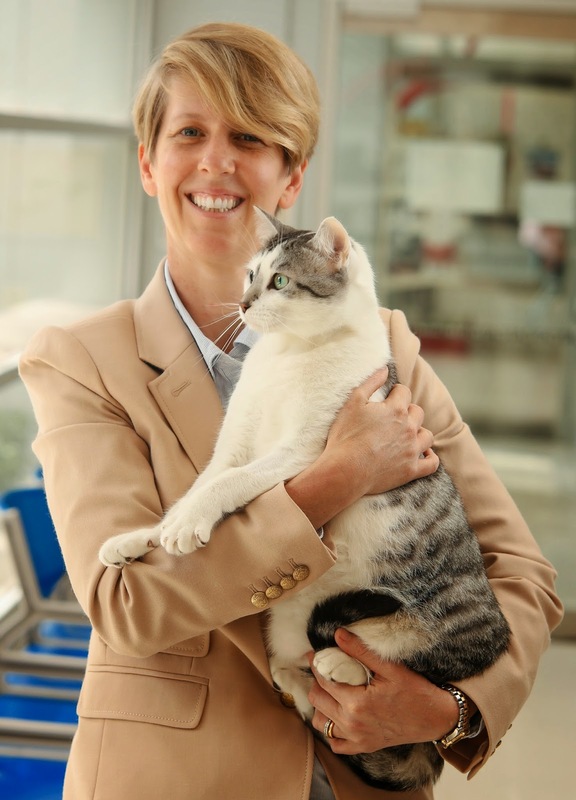 We spoke to Dr Vanessa Barrs, a feline specialist who was awarded a PhD in mycology recently, about the challenges of diagnosing and treating these diseases in feline patients. As a companion animal practitioner, the most common fungal infections I see in cats are dermatophytes or ringworm. But as a feline specialist you've diagnosed systemic fungal infections, or mycoses. What are the key systemic mycoses that affect cats in Australia? The major ones that affect cats in Australia are cryptococcosis, aspergillosis and phaeohyphomycoses. Australia has one of the highest rates of cryptococcal infection in cats in the world. Until recently ‘crypto ’was the only systemic mycosis on the radar for most practicing vets, and with the availability of antigen tests for diagnosis, with high sensitivity and specificity (like the latex cryptococcal antigen agglutination titre (LCAT) many vets have diagnosed and managed cases of cryptococosis in vet practices around Australia. Aspergillosis, on the other hand, is an emerging mycosis of cats globally. Aspergillosis in cats generally takes two forms – a focal form restricted to the upper respiratory tract, or a disseminated form. The latter was diagnosed most commonly twenty or more years ago in young cats immunosuppressed from panleukopenia infections, but we don’t see much of this now. Upper respiratory aspergillosis was rarely diagnosed until recently. Interestingly, the very first case in a cat was diagnosed in 1982 by Dr. George Wilkinson, the “grandfather” of feline medicine in Australia, from the University of Queensland. Then, no Australian cases were reported for many years. Now, in 2015, Australia has recorded the highest number of cases of this disease in the world. Phaeohyphomycoses are the third most common “deep” fungal infection affecting Australian cats. These fungi are distinctive because they have melanin in their cell walls. They cause opportunistic infections when they are inoculated into the skin from penetrating wounds, or inhaled. With global warming the prevalence of fungal infections in animals and humans is predicted to increase, because of more favorable environments for fungi to grow over a wider geographic range. On that note, we are starting to see other “unusual” fungal infections in cats presenting to the Valentine Charlton Cat Centre at the University of Sydney, like scedosporiosis, which is a filamentous fungus that belongs in the “hyalohyphomycoses” group. Dr Barrs with a feline patient. How did you get involved in researching fungal diseases in cats? It started back in 2006, when I was referred three unusual feline cases of upper respiratory tract disease. My investigations revealed they all had aspergillosis of the nasal cavity and sinuses, with additional orbital involvement in two cases. In fact those two cases were presented for “a swollen eye” by their owners, because the fungus had grown behind the eye and pushed it forward. What was even more interesting is that none of these cases seemed to be caused by Aspergillus fumigatus. At that time, it was widely accepted that A. fumigatus was the most common cause of this disease in cats. Co-incidental to these three cases turning up, colleagues at the Centre for Infectious Diseases at Westmead Hospital, including Dr. Catriona Halliday, had requested submission of samples from cats and dogs with mycoses to evaluate a new PCR assay that they had developed for diagnosis of fungal infections in people. The PCR sequences of the fungi from my cats were closely related to but different to A. fumigatus. My interest was piqued, and I decided to research this disease in cats further. I enrolled in a PhD part time. Colleagues at Westmead hospital were extremely helpful and collaborated on the initial molecular identification studies. It wasn’t long before we had 23 new cases for study from around Australia, thanks to the willingness of Australian veterinarians to contribute cases and support clinical research. I was fortunate to then be awarded an Endeavour Research Fellowship from the Australian Government that enabled me to continue my research with Professor Robert Samson’s group at the renowned CBS-Fungal Biodiversity Centre in Utrecht, The Netherlands. We were able to confirm that a new species of fungus, Aspergillus felis, is the most common cause of sino-orbital aspergillosis in cats. Aspergillus felis is inherently more virulent than A. fumigatus and more likely to be resistant to antifungal drugs. My interest in fungal infections in cats (and dare I say it, dogs) is ongoing. Currently, in my lab, four vets (2 PhD and 2 Masters students) are investigating multiple different areas including where these fungi live in the environment, why certain breeds of cats are prone to respiratory aspergillosis, diagnostic tests and pharmacokinetics of new antifungal drugs. Why do cats get systemic mycoses in the first place? That is a very interesting question. We have some answers, but there is a long way to go before this question can be fully answered. Two things have to happen for these mycoses to occur – exposure to the fungus, and failure of the immune-system to eliminate it. The first varies with geographic region. For example “hot spots” for cryptococcosis are Australia and the Pacific Northwest. Fungi like Cryptococcus and Aspergillus live in the environment in places like soil and decaying plant matter BUT they can also be found in air and water, so it’s not just outdoor cats that are exposed. In fact in one study of cats with cryptococcosis a quarter of cats were indoor only pets. There are many reasons why the immune-system might not be able to eliminate a fungus after it is inhaled or inoculated, and these depend on a complex interplay between the cat’s immune-system (host factors) and virulence factors of the fungus. We know that in Australia certain breeds of cats are more likely to develop these infections. For example Ragdoll cats appear to be prone to both cryptococcosis and upper respiratory aspergillosis. Pure-bred cats of Persian lineage (e.g. Persians, Himalayans, British shorthairs) are susceptible to upper respiratory aspergillosis. Why is this? Certainly an inherited immune-disorder is possible. But, these cats also have brachycephalic conformation, which means there nasal cavity and sinuses are anatomically quite different to other cats. It’s been proposed that this might make the microenvironment in the nasal cavity more favorable for fungal colonization. Other factors like previous viral upper respiratory infections are also implicated. Cats with suppression of their immune-system from disease or drugs, are also susceptible to systemic mycoses. For example, I saw a cat with severe rheumatoid arthritis that was being treated with immunosuppressive drugs develop a disseminated fungal infection (a phaeohyphomycoses). Why are fungal infections difficult to diagnose? Fungal infections can be difficult to diagnose because they can mimic other diseases like cancer, and testing for them can be complicated. Fortunately, for both cryptococcosis and aspergillosis, diagnosis is getting easier, thanks to new diagnostic tests. As I mentioned earlier antigen tests for cryptococcosis like the LCAT have been around for many years. They are very reliable and revolutionized our ability to diagnose this disease in cats. Newer, less expensive cage-side tests like the lateral flow assay (CrAg® LFA, IMMY) will also help us to rapidly achieve diagnosis of this disease. My group evaluated an antigen test (serum galactomannan) for respiratory aspergillosis in cats. It is not very reliable and not recommended for routine screening tests. We then evaluated serum antibody titres (IgG) by ELISA and found that this testing methodology has an excellent ability to discriminate between cats with upper respiratory aspergillosis and non-infected cats. There’s been a fairly widespread conception that fungi are hard to culture from cats, but this is in fact not true. Both Cryptococcus and Aspergillus fungi can be readily cultured – the trick is getting good diagnostic samples. For example, some cats with cryptococcosis only have infections right at the back of their nasal cavity, so culture from nasal swabs can be negative. We showed that fungal cultures were positive in over 95% of cats with upper respiratory tract aspergillosis. What makes them challenging to treat? These infections are challenging to treat for lots of reasons. We know little about how antifungal drugs work in cats, and for some mycoses the best treatments have not been identified. The treatment period is often much longer than for other infections, e.g. bacterial infections. Typically, cats require treatment courses of many months for cure, but it does vary from cat to cat and from mycosis to mycosis. Treatments can also be expensive. Owners need to be dedicated and able to keep in regular contact with their veterinarian to monitor their cat’s recovery. The prognosis for cryptococcosis overall is good. The prognosis for aspergillosis depends on the type of infection. If the infection is just in the nasal cavity, then the prognosis is favorable. If it’s an orbital infection the prognosis is currently poor overall, although individual cats have been cured. Are there any recent developments that might improve the outcomes for cats with systemic mycoses? There are quite a few new developments in the field of veterinary mycology. We’ve recognised that to get the best outcome we need to know quite a bit about the fungus that is causing it. Where possible, identification of the fungus should be performed. As we’ve discovered, this is not always just a case of sending a sample to the lab for culture. In many cases in order to identify the fungus, molecular techniques are required. This means arranging for your vet lab to send the fungus to a Mycology Reference Centre (e.g. www.mycology.adelaide.edu.au) or to an institution that specializes in fungal identification. There is new information coming out about antifungal drugs in cats. We’ve shown that posaconazole, a newer generation triazole antifungal similar to itraconazole, is well-tolerated by cats with clinical infections. Researchers at North Carolina State University have recently published findings on pharmacokinetics of this drug in dogs, and results from a similar study in cats are anticipated to be available soon. My lab is happy to talk to any vet from around Australia with a feline fungal enquiry (vanessa.barrs@sydney.edu.au). Thank you Vanessa. And thank you to all of the mycologists and fungal experts who have contributed to research on mycoses in Australia. We’re looking forward to seeing you at the International Society for Human And Animal Mycology congress.